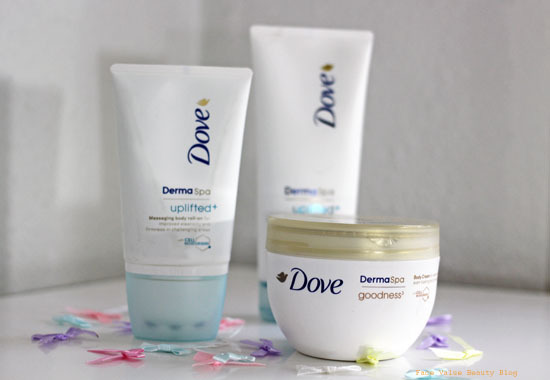 New Dove DermaSpa Body Range – What’s Best For Winter Skin? When it comes to skincare and body products, I find there’s often a trade-off between what smells and feels nice, vs what actually works. Why can’t products just be perfect? Yes, what a surprise, some stuff is just there to look and smell nice and DOESN’T actually do anything for my winter weathered skin. With the cold weather in full swing (have you got your winter coat out yet? ), my legs are soon to become more scaly rather than smooth. Serious moisturising is required, but let’s be honest, who really has time to do it every day? For me, this lack of skin-loving can only be resolved by high quality body care. I’m so bored of body creams which smell nice but don’t really do anything to soften my winter skin. That’s why I was more than a little bit excited when this Dove Dermaspa bundle dropped through my door. Billed as Dermatalogy meets Spa (ie DermaSpa, duh) this range is a unique bodycare collection that is both nurturing AND luxurious. Sounds good non? Dove DermaSpa is split into three categories – Goodness, Uplifted and Summer Revived. All designed for results, whilst smelling and feeling great. There’s a range of body oils, creams and lotions but for me, there were three products that really stood out from the range. Firstly, two products from the uplifted range: the Uplifted Body Roll-on and the Uplifted Body Lotion. The Uplifted Roll-On looks a bit tortuous doesn’t it? However it does a great job of energising and jiggling my wibbly bits. 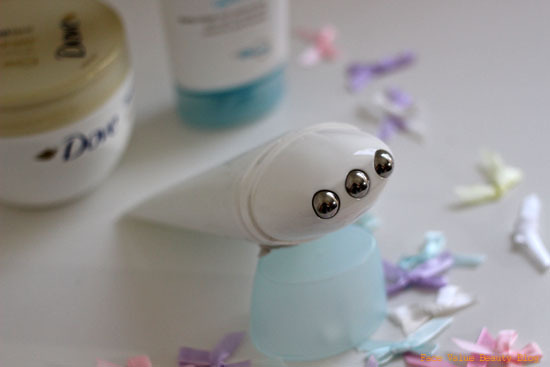 I feel like encouraging the circulation has more of an important impact than the cream, and the special built in cap helps you to do just that. It reminds me of the Soap & Glory Sit Tight, but it’s not tingly or sticky. Brill. The Uplifted Lotion is delightfully light and smells great for something which is meant to be toning your tummy. It’s Waterlily & Cucumber! All the similar things I’ve tried have all smelt quite medical, or minty, so it’s refreshing to have something that smells more relaxing and less invigorating. 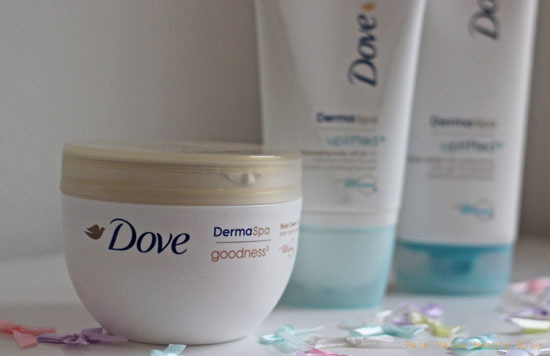 Completing the podium is the lovely DermaSpa Goodness Body Cream. Firstly, it comes in a lovely pot that’s highly satisfying to scoop your fingers into, know the feeling? Secondly, it absorbs quickly without feeling heavy. Although I have dry skin, I feel like heavier creams just sit there on top of my skin, but this stuff does actually absorb quite nicely. It’s got Omega Oil in it and the scent is something I can’t quite put my finger on. It’s apparently Vanilla, with Coconut and Citrus and Frangipani. Sounds delicious, it’s making me hungry.. Either way, I’m so over all these ridiculously sweet smelling fruity creams that just sit on my skin and sweat (can’t believe I used to be a huge BodyShop Body Butter fan – the stuff makes me feel like a giant oilslick now!) 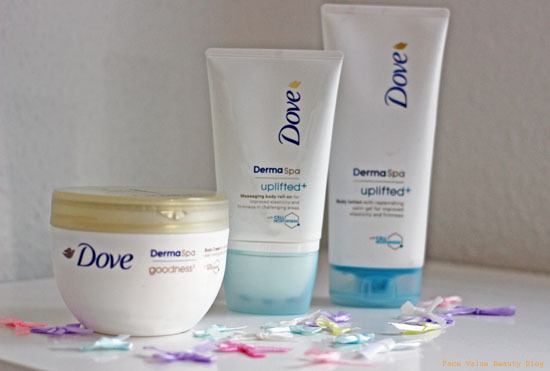 – so this Dove Dermaspa stuff seems like a natural progression into more a sophisticated skin treat! What do YOU think? Is there time to body moisturise everyday? Tweet me your thoughts @FaceValueBlog or send me a comment on Facebook! VICHY Normaderm Part 2: The Results!